Care for a little Chanel? How about hundreds of delectable vintage suits, hanging closely together in the fantasy closet of a fashionista's dreams, with tweed jackets in plaids, pastels, or florals? Nearby are the historical garments, which range from the 18th century onward, including dresses from the Civil War era, "just like ones you'd see in an Impressionist painting," says Valerie Steele, the museum's director and chief curator. It was Steele who had to cull through this huge permanent collection, and a half-century worth of FIT exhibits, to come up with "Exhibitionism," a new show that opens Friday and celebrates the museum's 50th anniversary — just in time for New York Fashion Week. There wasn't room enough in the museum to spotlight all of the favorite exhibits from 50 years — there have been more than 200 — so Steele whittled it down to 33, each of which are represented with a vignette. They include "Fairy Tale Fashion," a 2016 show that illustrated 15 well-known fairy tales using both clothes — like the iconic red riding hood — or accessories, like the glass slipper. A real red hooded cape from 18th-century England stands next to a more modern one by Rei Kawakubo of Comme des Garcons, featuring a shiny, quilted patent-leather hood. An eerie sight is Thierry Mugler's short black vampire dress, worn by a mannequin stepping out of a coffin, from the 2009 show "Gothic: Dark Glamour." Also featured is "Fashion and Surrealism," a 1987 show that was one of the museum's most popular; an eye-catching (literally) suit by Larry Shox features a pattern of huge, disembodied eyeballs. And if you like corsets, look no further than the waist-cinching examples from the 2000 show aptly named "The Corset," exploring what the museum calls "the most controversial garment in fashion history." The retrospective also touches on social themes, with highlights from "A Queer History of Fashion: From the Closet to the Catwalk," from 2013. "It was really the first significant exhibition of LGBTQ influence on fashion," Steele says. "We thought we would just begin with the mid-20th century, but it turns out that gays and lesbians had a big impact on fashion as early as the 18th century, as trendsetters." 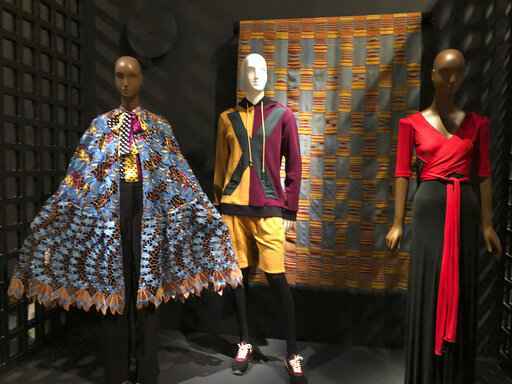 Also represented is "Black Fashion Designers," a very popular 2017 show that displayed work by more than 60 black designers of different generations. A wide, brilliantly colored cape by Duro Olowu, the Nigerian-born designer, is paired here with a red-and-black wrap-style gown by Scott Barrie. "I think in the past there was much more of a kind of male chauvinist view that fashion was something frivolous and feminine ... just about hemlines," she says. "Increasingly over time, younger generations came to accept that fashion is significant. "It's a multi-billion dollar business," Steele adds. "It sometimes has a really bad impact on the environment. But it's also a way that individuals can express themselves." That collection, housed in two huge rooms closed to the public, includes garments that are so fragile that "they have to lie down," in Steele's words, lying on neat shelves and protected by acid-free paper. On a brief tour through one of the two rooms last week, staffers watched carefully to make sure no garment was accidentally touched by a bare hand — or a journalist's camera. Steele pointed out famous dresses like a pink cocktail number with a rose at the waist by Yves Saint Laurent for Dior, featured in the recent exhibit "Pink: The History of a Punk, Pretty, Powerful Color." Draped over a specially made artificial body was a two-tone pink-and-red gown by James, the mid-20th century designer who specialized in spectacular, sculptured dresses constructed with intricate draping techniques. "This one can neither lie down nor hang from a hanger," Steele explained of the fragile ballgown. "Fabulous," Steele pronounced. "He was a real architect of shape." "Exhibitionism: 50 Years of the Museum at FIT" opens Friday and runs through April 20.